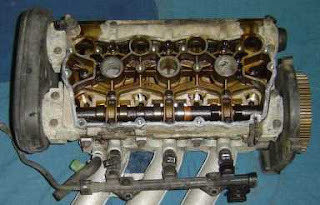 Seeing a picture of a Rover KV6 cylinder head, it occured to me that this was the top half of a great unrealised engine. 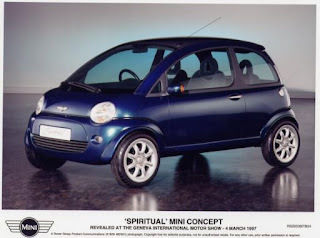 Mentioning the idea elicited a reminder that a three cylinder version of the K-Series powered the Mini Spiritual concept car shown by Rover at the 1997 Geneva Show, in this case mounted horizontally at the rear of the car. Had it been launched at the same time as the four cylinder K-series engines, a high-efficiency three would have added interest to the 1990 Metro relaunch, and a 1250cc 12 valve K3 would have been a far more interesting and effective offering than the poverty spec 1100 and 1400cc K-Series in the R3 Rover 200/25. Given the likely a cost saving over the four, it could be used to provide a higher level of sophistication - four valves per cylinder, injection instead of a carburettor in the early engines. There's also the possiblility of a 1350cc 120bhp K3-VVC, which would deliver more power than the 1.4 litre fours in the Metro, with a very different character. Rover could even have been used with an-end on gearbox in the Mini, rather than prolonging the life of the A-Series for one low volume product. The bottom end would have needed some work - uneven cylinder numbers are hard on crankshafts and bearings, and some kind of balancer shaft would have been a good idea. If Rover ever took the idea seriously, there was already some three-cylinder experience available within the company from the 1982 ECV3 project pictured above.